Note: The following post is sponsored is sponsored by Cub Foods. All opinions are 100% my own. Please read our full disclosure policy for more information. I was having one of those days where I was pulled in 10 different directions. I barely had time to jot down a few items on my grocery list before I headed to the store. I certainly didn’t have time to scour the internet for coupon match-ups and deals. But I still saved money thanks to the new digital coupons at Cub Foods. I opened the free mobile app on my phone, picked “e-coupons” from the menu and clicked which coupons I wanted to use. As I shopped, I remembered a few more things that should have been on my list and was able to find coupons for those with just a quick search of the app. Then all I had to do was show my MyCubRewards card to the cashier and enjoy the savings. I didn’t have to clip a single coupon or even remember to bring my coupon binder. 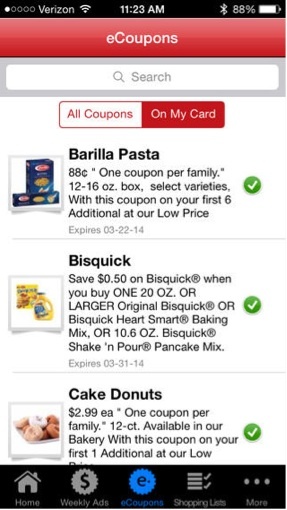 It’s not the first time the new digital coupons at Cub Foods have helped me save. It’s been a huge help when sending my husband to pick up a few items while he’s in town. He appreciates saving money with coupons, but has minimal interest in tearing them out of the ads at the store. So I had him put the Cub mobile app on his phone. 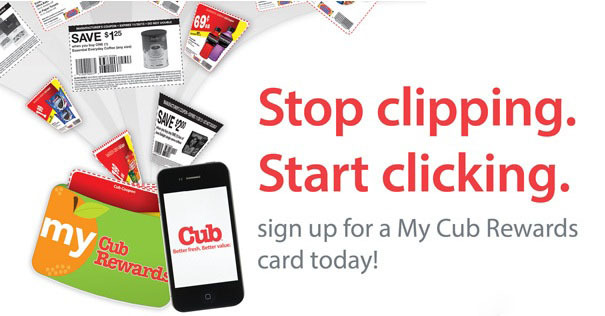 Now all I have to do is go to the Cub website (or use my smartphone) and pick the coupons to add to our MyCubRewards card. I can even create a shopping list for him to access from his phone. He can pick up what we need and use our MyCubRewards card to save. I also set up a card-less id (it’s just an 11 digit number, so I used 1+ our home phone number with area code), so we can still save even if we don’t have our MyCubRewards card with us. My husband is happy to make a quick trip to the store for me when there’s no couponing hassles, and I’m happy to get what we need at a great price! If you haven’t signed up yet for a MyCubRewards card, you should. In addition to making clipping coupons a cinch, you’ll also earn a 5 cent per gallon fuel discount at Holiday stores for every $50 you spend at Cub. It doesn’t take long for the savings to add up! We don’t have Cub where I live, but Safeway offers a similar digital discount program. It is pretty darn cool.